In many ways, Gay embodies the blues music that plays softly as he tells his story; there is a palpable sense of hardship, of tragedy, always tempered with the desire to cry out and be heard as a means of catharsis and, ultimately, growth. 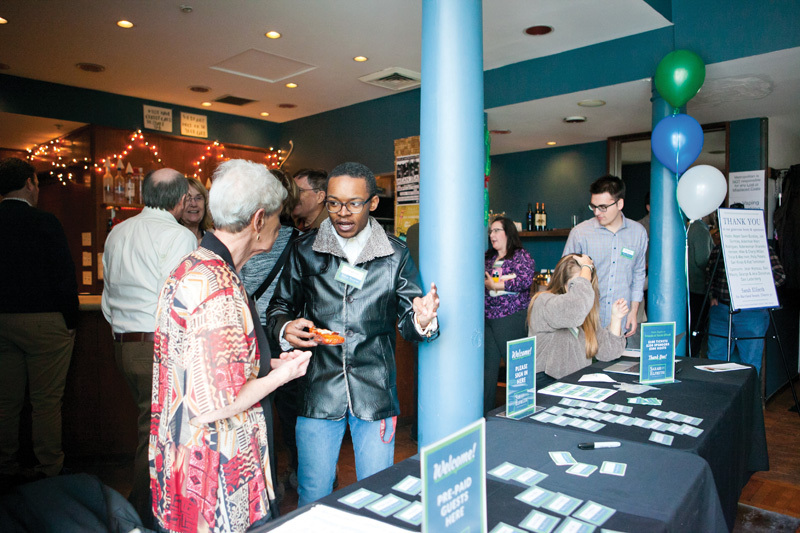 DaJuan Gay welcoming guests at a campaign sign in table for Sarah Elfreth for State Senate – District 30. When he was 11 years old, Gay moved to Annapolis with his 29-year-old single mother and four younger siblings. Although his mother was battling thyroid cancer and the family was homeless for the first two years, Gay maintains, “I will forever be grateful for her decision to move to Annapolis.” For Gay, Bates Middle School was the first place that made knowledge seem attainable, the Boys and Girls Club was the first place that gave him a sense of community, and Annapolis was the first place that felt like home. It was that feeling of home that imbued Gay with a sense of higher purpose: service to the community. While fundraising for Annapolis High School, Gay was also fundraising for his future. Through GoFundMe, scholarships, grants, hard work, and personal merit, Gay was accepted to Slippery Rock University in Pennsylvania and became a first-generation college student—a fact he can’t help but relate with a smile. 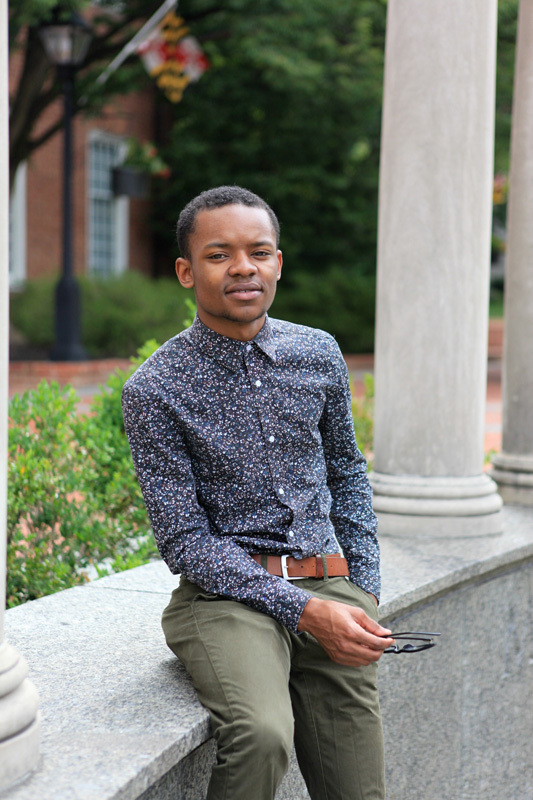 Just three months into his first semester, however, Gay was the subject of a racially motivated threat on campus. 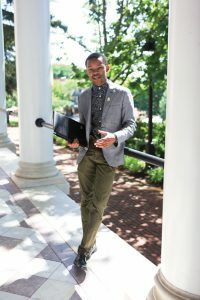 The incident had such an immediate and profound impact on Gay that he was unable to focus on academics and was back in Annapolis before year’s end. He transferred to Anne Arundel Community College, but the ordeal left Gay with such an overwhelming feeling of failure that he became depressed, with suicidal thoughts. DaJuan Gay talks policy, vision, and strategy during his Ward 6 Aldermanic campaign. The summer of 2016 put things back into perspective for Gay. Alton Sterling and Philando Castile had just been killed by police officers in Louisiana and Minnesota, respectively, and racial divisions were wreaking havoc on communities nationwide. Gay forced himself to step outside of his personal struggles and figure out a way to bring healing to his beloved Annapolis community. Under the banner of the Black Lives Matter movement, Gay organized a mile-long march with over 300 participants that began at his alma mater, Bates Middle School, and ended at the Kunta Kinte-Alex Haley Memorial at City Dock. Gay couldn’t ignore the tangible impact he was able to have on his community and his own sense of self. “I wanted to shift that momentum into politics,” says Gay. “I wanted to do things the right way. I wanted to invest in my community. I wanted to get the community involved and engaged.” In 2017, at age 19, Gay announced his candidacy for alderman for Ward 6 on the Annapolis City Council. While campaigning, Gay moved back in with his mother and now five siblings in Eastport Terrace. Upon returning, Gay found the tight living situation exacerbated by the lack of air-conditioning. Gay sprang to action, employing his fundraising and community organizing skills, and raised $14,000 in just two days, supplying 85 families, including his own, with air conditioning units. Error: Error validating access token: Session has expired on Saturday, 09-Mar-19 15:57:50 PST. The current time is Tuesday, 23-Apr-19 09:01:48 PDT.